After a few days off during their 40th anniversary North American tour, the Damned are back, with co-founder Captain Sensible using an onstage “throne” to support his recently broken rib. Not only that, but the band have also signed a deal with Raw Power Management on its label Search and Destroy, which is a joint venture with Spinefarm and Universal. 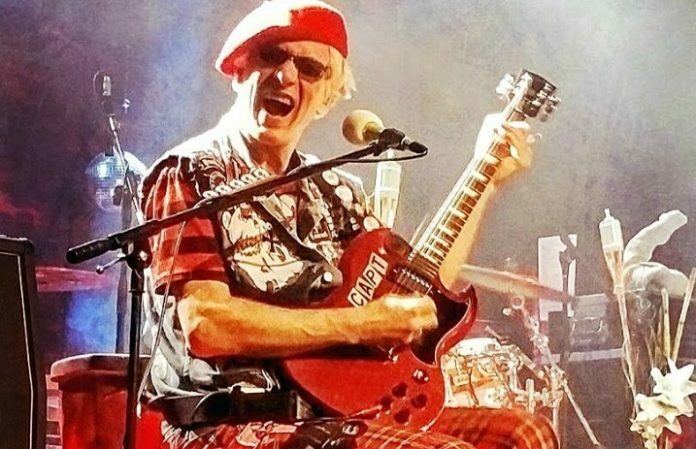 Captain Sensible fell off stage and injured his rib during the Damned's stop in Toronto. The Montreal, Boston and New York shows are all postponed to late May, but tickets and VIP packages will be honored. However, the Damned made their triumphant return on Saturday at a sold out show in Asbury Park. “As movement is a bit awkward currently, I played last night seated, but it all went swimmingly, and this epic 40th anniversary tour is now firmly back on the road,” Captain Sensible says. “We've played some great venues on the trip… and Asbury Park's Stone Pony is up there with the best of 'em. “But I have to say I wish I'd waited till here before backflipping off the stage, as this one was only 3 feet high. D'oh!,” he continues. With their signing to Search And Destroy, the Damned have a new album in the works, which will follow up 2008's So, Who's Paranoid?. The forthcoming album will be the band's eleventh.